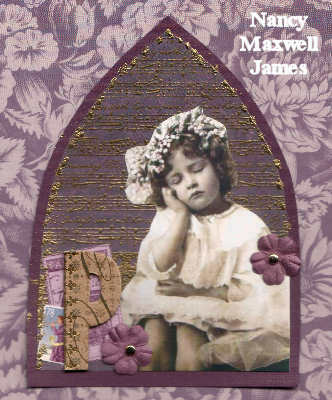 This weeks theme at Gothic Arches is “Purple”…my favorite color. I am a February baby, my birthstone (amethyst) and birthflower (violet) are also my favorite color. What do you think of when the color purple is mentioned? Violets growing sweetly in a meadow? Rich jewels on the Queen’s crown? A deep rich starry sky? Whatever the thought may be we want to see it here at Gothic Arches. My name is Nancy Maxwell James and I live in Michigan with my husband and our 3 fur babies. I have three children: Ian who is a collage student, Andrew who is serving in the U.S. Army in Iraq, and a daughter Allison who is also a student. 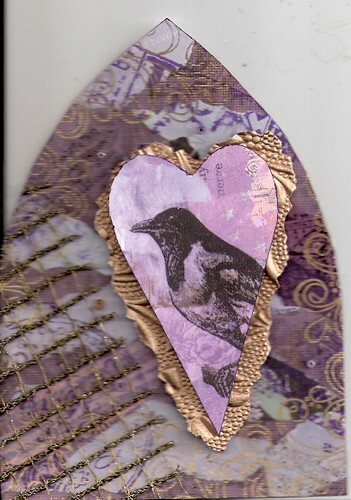 I love mixed media, cards, scrapbooking and genealogy. I also love all the wonderful artists and friends I have met through blogging. In celebration of my birthday this week I selected purple as our theme. I have always loved the color and have many trinkets and keepsakes that I collect that are purple. My Grandmother also loved the color and passed down many precious heirlooms to me because we shared that love. You many visit my blog http://vintagepapers.blogspot.com to see more of my artwork. Wishing you a wonderful birthday Nancy! Thanks Nancy, it was nice to work with this colour again. Hello! Here is my card. I love purple! What a wonderful Theme! Wow ! it’s not easy for me, ’cause I hate purple, lol !!! Lovely colours to use today. Looking forward to seeing all the other arches. I had a great time playing with a color I rarely use….thanks! One of my favourite colours, so thanks for the lovely theme! here is my purple challenge! Nancy, happy birthday to you. Thanks for the purple challenge. here is my purple arch ! This was a great theme. I love purple, but I don’t use it very often in my art, so it was good to shake things up a bit. Here is my first entry. I just had to stop and do a purple arch. How anyone cannot like Purple is beyond me! As everyone who looks at my blog knows it is my favourite colour so thank you for this challenge. Happy Birthday to you, Nancy…whatever your date is in February! I’m also a February birthday and that’s what inspired by arch today. I’ve posted it at http://art-interrupted.blogspot.com/. Oh my God! I’ve made a mistake! You’ve said purple, but I had pink in my mind and make a pink arch! Sorry! This happens when you have to many things to make. Happy Birthday, Nancy! Here’s my Purple Arch! Here’s my arch. Thank you for the challenge to use this color…I always forget how much I like it! Here is my purple arch, thanks for looking ! My very first Gothic Arches challange, I hope you will enjoy looking at my first try to make Arches. Thanks for visiting. My second entry, with the correct link. What a great theme. Thanks Nancy! Here’s my purple arch – I forget how much I love this color! I don’t use it nearly enough in my day-to-day creativity. My purple arch is here. This was a beautiful choice of themes. I have mine all done and on my blog. I can’t express how thrilled I was to see my arch on the blog here. Thank-You. I look forward each week to these lovely challenges. Purple isn’t my fav, but what an exchange of color and spirit. Fantastic art. here’s my link. Ik hoop its purple enough;o) Here is mine, the first Arch. HAPPY BIRTHDAY NANCY – I hope you had/have a lovely day doing EXTRA special things & that 2008 is a great year for you & yours!